Now this is a BIG cat! Doesn’t this cat look adorable? My mom thinks she looks like a kitten – a BIG one! She fills up my dog bed. Posted on June 15, 2013 Categories dogs and catsTags catsLeave a comment on Now this is a BIG cat! Ophelia has been ailing again. She didn’t want to eat. 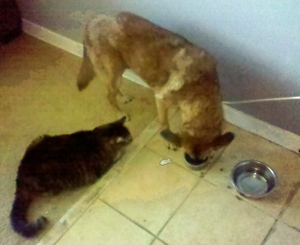 I offered to help by eating Ophelia’s food but you can imagine what the Mom said. Ophelia nibbles. My mom keeps coaxing her to eat more. Ophelia stopped purring. So my mom took her to the vet today. The vet agreed: Ophelia has taken on the qualities of a very old cat. Even so, my mom never tires of saying, Ophelia spent 30 days in a cage in the Seattle SPCA. She was lucky to get adopted at all. I’m a neutral observer. Treat, please? 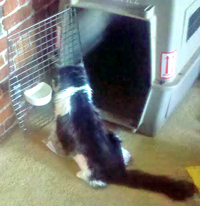 Cat drinking from dog’s crate: should not be allowed! Look at this impertinence. My crate has been placed in a corner of our living room because my mom can’t figure out where else to put it. So Ophelia decides she wants to drink from MY water dish. Ophelia has always liked drinking from dishes, glasses and cups that aren’t hers. She drives my mom crazy: she drinks my mom’s ice water, iced tea and even iced coffee. When she doesn’t find anything to drink from my mom, she goes to my crate. She has a perfectly good water dish of her own, right on the floor next to mine. Ophelia’s shape is a little odd because some of her fur was shaved for her ultrasound. It’s growing back very slowly. She doesn’t seem to notice, but we do. Ophelia has always been the Queen. I’m just the princess. Life is tough. Posted on May 27, 2012 June 27, 2012 Categories dogs and catsTags cats2 Comments on Cat drinking from dog’s crate: should not be allowed! Look who’s on a home page – top story of Your Organizing Business! Our own housemate. My mom wrote a blog post about how starting a business is not unlike adopting a cat. To illustrate, she used the photo of – who else? The cat who inspired the story: our own expensive adoptee. My mom just read me this article from the New York Times. Apparently some scientists studied how cats drink water. “Much classier than dogs,” was the conclusion. Do we need to know? Do we care? The real question is, why do cats drink water from glasses and cups, turning up their little pink noses when mom pours water into their official water dishes? Now that would be useful.